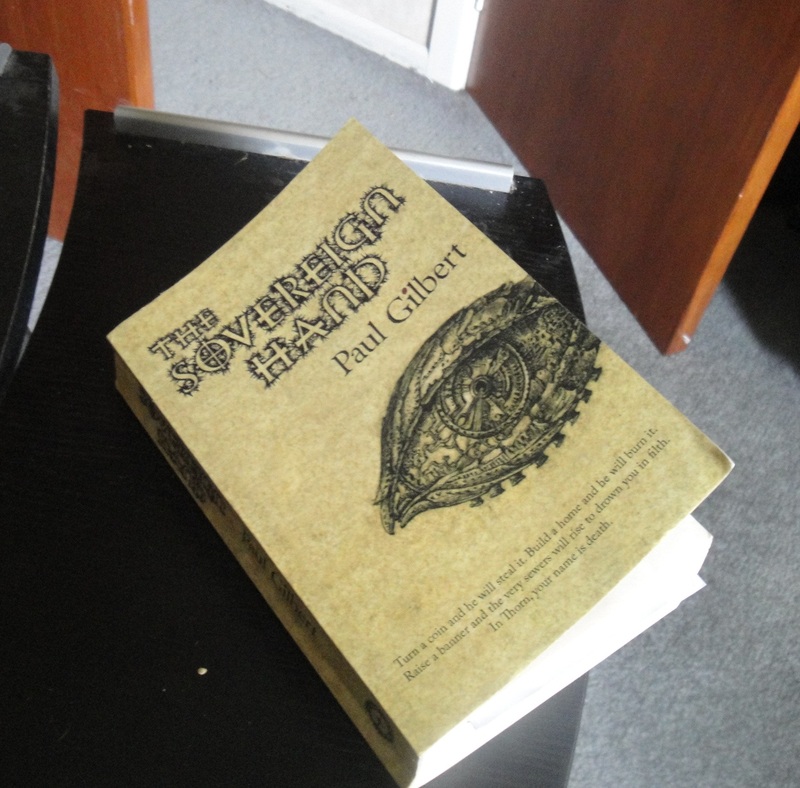 All info and updates on the forthcoming novel, The Sovereign Hand. When you’ve been working on a project for ten years, probably written several million words, you get kinda casual about reporting that yes, you are working on another draft and it will soon be back in the hands of your publisher. It’s draining enough doing it, without writing about doing it. I don’t even really talk about it. It’s a grunt and a nod. It’ll get done. Little Train That Could, n’all. But now, happily, we’re at the stage of “real” things happening. First, a cover. It took much back and forth to get this how Stephen and I wanted. For a long time it felt like nothing would please me – and it’s true, it’s almost impossible for any cover to properly reflect the many varied dimensions of the story – but this one does its job well. The title font evokes the foundation genre well, an impression modified by the font choices for my name and the tag line, the latter being most modern. Equally the eye is a significant image from the text and adds interest with its detail. In short, it speaks directly to those who identify with speculative fiction, while remains understated enough, with enough intrigue, to attract the wider readership it suits. We hope. And now the proof is in my hot little hand. Okay, this arrived three weeks ago – at this point it’s clear that I have been less than diligent about my updates, tis true – but excuses and explanations for that can wait till tomorrow. For now let’s say she is weighing in at a flattering 452 pages in what I find a very attractive typeface. Pretty damn pleased, and this is where things are at: me scrawling final changes before sending it back. If I motor, that will be by end of May. Of course, the arrival of a proof also means that people are reading it. Bernard Beckett is author of the award-winning Genesis (a personal favourite that I recommend to everyone) and writes elegantly and knowledgeably on a vast field of topics, while also managing to be a secondary school teacher on the side (and father, and husband – I know better than to leave those out). All his writing has that most critical quality: something to say. So his praise is like gold to me. I’ll have to dart over to Neil Gaiman’s blog for tips on how to shamelessly integrate such comments to my site. But there’s more. Without blowing anything too early, there is a real prospect of some major international exposure for The Sovereign Hand, probably in July, online. Stay tuned. Shortly after that, I hope to have Part One, the first quarter or so of the book ,up online as a free download. I’m a great believer in try-before-you-buy, where possible, and The Sovereign Hand has so much to offer, there’s no reason not to share. Last, thanks for stopping by. Welcome to my new followers on Twitter – I don’t really use it , but will always tweet when I have news specifically about my book (such as this post). Additionally, if anyone has some other media they prefer to use to keep in touch, for instance a Facebook page for The Sovereign Hand, just let me know in the comments or contact page. If there’s demand, I can add it. But the easiest way to catch every update is just to follow the blog. Tomorrow, The Luminaries (finally), and a little more on what I’ve been up to. 2013 was my Christmas of Literary Giving. 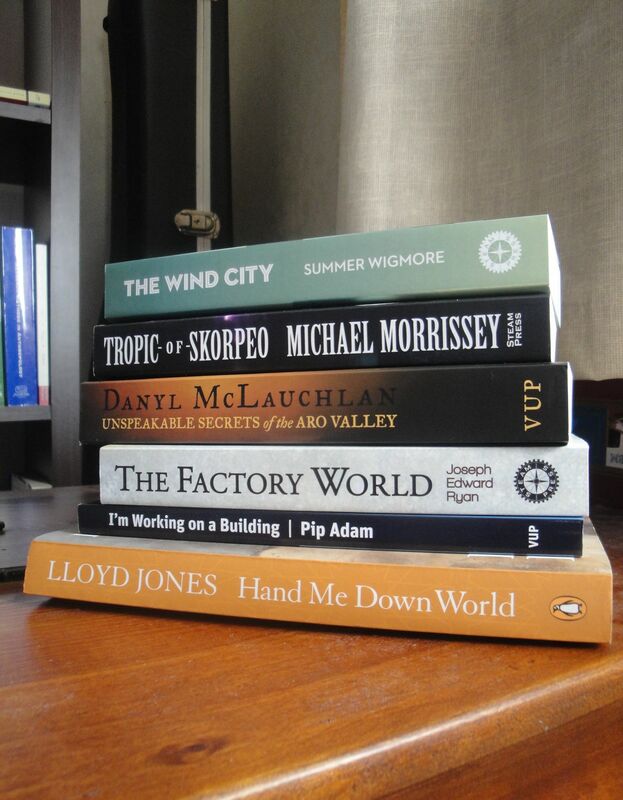 All my family got great NZ books, as pictured, plus The Rosie Project by Graeme Simsion‎ (a thoughtful choice, which my mother promptly vetoed by exchanging it for Amy Tan – sigh.) Of the seven, I’d only read Tropic of Skorpeo and The Factory World, so I was giving away treasures I actually want to read myself: an inverted narrative about the construction of the world’s tallest building on the west coast of the South Island; Wellington’s Aro Valley has a hotbed of adventure, dark magic and intrigue – maybe with The Wind City‘s Maori gods romping around in the capital at the same time? Definitely no lack of entertaining ideas. Of the books I have read recently, I enjoyed Hamish Clayton’s Wulf, historical fiction fusing Te Rauparaha with the Beowulf epic. Sometimes I take just one or two things away from a novel, and in this case it was the evocative emphasis on a New Zealand that was all “black and green”, without the imported autumnal colours. Living in Dairyland, I was really impressed by that simple point, and kinda yearn to be in that long-gone place. Makes me appreciate my time in what remains of our bush even more. Having now read The Trial, it is hard to argue – it resonates with my experiences with Inland Revenue, even challenging a parking ticket, any bureaucratic power. Has anyone not hit their head against a govt department wall? And now they are gathering all our information so they think they have even more god-like powers to judge guilt before innocence, and for anyone hoping to change the world this is chilling to the core. Aaron Swartz was, of course, driven to suicide last year. No official of any sort will be held responsible for the witch hunt. He was 26. The most challenging and fascinating, and impressive, novel I’ve read lately is Sleight by Kirsten Kaschock. As a writer, you are attracted to reading that resonates with your own writing. I enjoy texts that ask the reader to make their own connections, and our understandings of the characters, the story, and “sleight” begin as disparate then coalesce, in the same way the sleight troupe’s practise comes together and arrives as a singular definitive event. In this way, the subject mirrors the novel’s structure, which is always effective, when achieved. The multi-dimensional, abstract, almost impossible performance art-dance Kaschock created in sleight also resonated with the abstract-impossible aspects of The Sovereign Hand: those elements that are often decribed as “unfilmable”, where concrete description and detail surrender to an impression that eludes reality, and is all the more potent for it. The slake moth of Perdido Street Station and the perpetual train of Iron Council come to mind; the affect of scent in Süskind’s Perfume; In The Sovereign Hand, it’s the diablerie, in particular. All evidence that sometimes you can not just call a spade a spade, that you need richer language to unchain the reader from unthinking signifiers and permit them to draw their own ring around whatever is signified in their mind. That’s what speculative fiction, in whatever genre, does best. Next post: Joe Sacco’s Palestine, The Luminaries, and maybe a bit more about my book. It has been another month of line-edits, insertions and deletions; all undoubted improvements, but I always find it unsettling. The text is such a well-traversed field, yet with each tiny change it feels increasingly unfamiliar territory so by the end I want nothing more than to go back and read it all through again. Excerpt #2, like the first, came Runner-up in the Pikihuia Awards. With Rise and Shine I was pleased to get a literary award for a fantasy extract. With House of Mirrors, it was still fantasy, of course, but also a set-piece from almost the middle of the book: like a cold splash of water to the reader, given the unfamiliarity of the setting, lack of character intros, and general assumptions it makes of the reader’s knowledge. Far from a safe bet, so success at the Awards meant a lot, especially with the excellent Briar Grace-Smith as judge. I think it works well enough as an introduction for Tanner without spoiling too much. This excerpt includes the latest trial cover for the novel. It illustrates another aspect of the story, the political side. House of Mirrors takes a broad, inclusive brush to matters of political philosophy and sociology; the political motivations of the Crown and its actions are also significant in this part of the book. But the real political in the book, for me, is the personal, the choices and changes the characters make in dealing with power. So the pawn is an apt image and I’d be happy if it was what we finally decide upon. The mobi and epub versions of Rise and Shine are now available, along with the pdf, of course. Enjoy, share – remark, if so moved! Any feedback very welcome. At the current pace, I expect the next excerpt, House of Mirrors, to be up within a month. The publication of this excerpt is kind of a micro-product of the whole process at the moment: line edits and cover. The temporary cover on these files comes from a fantastic piece of 17th century art, the Temptation of Saint Anthony by Jaques Callot. It fits the story in a variety of ways, particularly as a literal, in-universe depiction of a past, defeated evil, or a figurative representation of the apocalypse that promises to be unleashed. I’m not sure whether we’ll end up working with it in any way for the final cover, but it fills the gap nicely while me publisher and I thrash through the options. Anyone suffering from the reality tv plague is likely to pick up a pitchfork or other wicked implement at the mere mention of a “journey”. There will never be a Writer Idol, but the process by which a writer becomes an author remains of enduring interest, at least for those hoping to become an author – “author” being an interesting enough concept in itself, even before the rise of self-publishing. That ahh-ha moment I mentioned: for other people, now you have authority, however small, over whatever plot of cultural space you’ve staked out for yourself. The ideas and effort were all there years beforehand, but only now do they have validity. Whereas our corporate news media can ascribe authority to any half-baked story just by stamping its masthead, thereby demanding our society’s respect and attention. Yes, I have some interest in authority. Gdammit, though, if writing about yourself doesn’t feel indulgent. So for the moment I will put any talk of journey aside and let details prop up as they will. In this case, the story of the first excerpt from the novel, now available free for download. This is Rise and Shine. When I returned from Australia in 2007, I was advised by an arts consultant to try and publish, enter competitions, get my name out there. Luckily enough, the Pikihuia Awards for Maori Writers has a novel extract category – I don’t know of any other such opportunity for novelists. Shortlisting was reward enough, which brought publication in Huia Short Stories 7. To come second? Well, the judge was on the record as disliking anything in the SciFi/Fantasy realm. Her awarding R&S second proved that my story, written my way, could surmount genre prejudices. I just had to hold the rest of my text up to that standard. Anyway, download, peruse. Love to know what you think. Addendum: Mobi and epub versions of Rise and Shine will be up by the end of the week. WordPress won’t let me host these file types, so I have handed them back to my dear publisher, who is out of town but will sort things by then. Writing is an end in itself, of course; something is always accomplished. But in our modern monetarist culture, that simply isn’t justification enough. Writing, as a profession, is not flush with outside investment. For the vast majority, and for all those starting out, that capital comes from one source. Inside. The writer. And they have to account, either in minutes or cents, dollars or hours, or days, weeks, years of blank cheques signed alternately in pain, hubris or pure will and self-belief. We make up these little coupons permitting us to do what we do, no more audacious than what our banks do creating credit, yet with vastly less authority. The lucky writer though, has at least one person who just takes that cheque on faith. Knows its worth. Believes. Until the rest of the world catches up. Even publishing, though, ascribes only a marginally higher status, with even less advance in wealth (power). Minutes are still precious. So any writing requires a little deliberation and clear intent. Especially for me. When I write my brain just keeps making connections. The final draft of The Sovereign Hand – which with an ensemble cast, multiple storylines, is no novella – is still 100,000 words less than the first full draft. Much of it whimsies and digressions, along with the expected first-novel first-draft chaff. So what can a reader of anarko demokratus expect? Terse forays, I hope, rays expanding from a small cluster of interconnected points. Those loci are key. So, reading, writing, literature local and beyond. Anything stemming from the New Zealand discourse that must be said – from the world discourse that must be said. Anything I find must be said. Two writers I enjoy with admirable blogs are China Mieville and Bernard Beckett. A lofty goal, but maybe something in those realms or in-between. Then, of course, there’s The Sovereign Hand. I will enjoy sharing tidbits of the novel’s past, present and future as publication looms. And extracts – the first of those, and another post, this weekend.